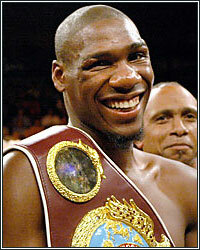 Paul Williams is an anomaly in boxing. Unlike most fighters, Williams has spent his earnings wisely outside the ring, investing in profitable real estate ventures. He appears to have avoided the tragic financial pitfalls that too commonly bestow a fighter in the afterlife of their career. But what is also curious about Paul Williams are his choices inside the ring, not so much the choice of his opposition. A fighter's choice of opponents is seldom theirs, but how he chooses to fight is. At 6'2" with an 82-inch reach in the light middleweight division, Williams should have a jab that keeps his foes timid on the outside and maintains enough distance to knock them senseless. But Williams is notorious for fighting "small", continually opting to trade on the inside rather than utilize his height and reach to neutralize his opponents from ever having a chance to touch his chin. Instead, we see the rangy light middleweight plodding behind a near-to-nothing jab, giving challengers ample openings to land clean shots. This was the case last Saturday when we saw Williams pummeled repeatedly by straight lefts at the hands of Erislandy Lara of Guantanamo, Cuba. What was meant to be a comeback for the tall and lanky super welterweight fighter, instead only raised questions of the former champion's current level of skill, perhaps even over his entire career. Once alluded by many observers as the next coming of the legendary Tommy Hearns, Paul Williams stood firmly in the welterweight landscape, referenced as a formidable foe for the top of the division and mentioned amongst the likes of Miguel Cotto and Shane Mosley. In fact, many speculated Williams' awkward dimensions and high workrate as being the key to dethrone pound-for-pound champion Floyd Mayweather. But Williams' career never panned out like the "Hitman". Instead of fighting in the sport's megafights, Williams found himself waiting on the sidelines, taking on moderate challenges and climbing the ladder of notoriety slower than most observers would have liked. It did, however, earn him the mythical image of being the "most avoided fighter" in the division. Unfortunately, that moniker would remain a myth. Making brief appearances in the light middleweight and middleweight divisions, Williams would go on to compile a short string of victories over notable opposition, such as Winky Wright and Sergio Martinez, before a quick left hand in a Martinez rematch put a quick halt to the Paul Williams express. Since then, lingering questions waited to be answered in his return to the ring. How would he deal with the brutal KO loss? Would his defense improve? Could he still take a punch? Could Paul Williams regain footing in boxing's landscape? Last Saturday, those answers did not show much promise. Before, the inability of Williams reaching the sport's pinnacle may have been a result of poor promotion, a lack of public recognition to leverage the fights he deserved, or just an inexperienced negotiation team. Now, the downfall of Paul Williams is a stubborn retention of style and a corner too willing to concede to that stubbornness. "So we're going to see Paul Williams again, no changes, just more of the same, but even harder," asked Max Kellerman during the post-fight interview. "You said it better than I can say it," Paul would respond. With his future financially secure, Williams appears to be set for life. Now he dreams about fishing with his kids. So why continue fighting? One simple fact: Paul Williams has too much heart for his own good. Kellerman would finish his interview by congratulating Williams on a courageous performance in his controversial majority decision win over Lara, just about the only impressive thing about his performance that night. It was courageous. Williams is the type of fighter that, when hit hard, he fights harder. Seldom do we see that in the fight game nowadays, and when we do, it's a refreshing reminder that the sport hasn't gone soft, that the fighting spirit is indeed alive and kicking. But Williams' use of this strategy last Saturday proved more painful than heroic. In some ways, Williams is a fight fan's dream, an exciting talent willing to mix is up with anyone. In other ways, he is one of boxing's most frustrating characters, one who doesn't capitalize on his god-given physical advantages, leaving spectators wondering at all the "what if's" that could have emerged from such a physical anomaly. So what's next for Paul Williams? The 154-pound landscape is cluttered with talent and with his recent outing, more of the division's contenders would be more than willing to face boxing's former "most avoided fighter". While Williams could use this to bait in challengers, he appears oddly content with his easily dissectible style, leaving the blueprint for defeat too accessible for future opponents. Perhaps a change in corner would help rejuvenate the young warrior's career. Emanuel Steward immediately comes to mind since he crafted the legend Williams was once compared to, but given his attitude of "sticking with what got him this far", perhaps it's too late for him to change. Williams is now gunning for a third fight with the hard-punching Argentine Sergio Martinez, the fighter that knocked him out cold in the second round eight months ago. Given last Saturday's continued effectiveness of the same punch that caught Williams in their last meeting, the outcome of a potential matchup between the two isn't looking too bright for "The Punisher". In about two weeks, Paul Williams will be turning 30. They say that the 30th year of life is the year of realization, the moment where we recognize that time is finite and life is short. For boxers, life is even shorter. Each training camp is a strain on the body, each landed punch is a potential hazard for life altering damage. In his fight against Lara, Williams took flush consecutive left hands to the head for 12 rounds. All three HBO commentators felt the punishment has taken years off of Williams' future. Hervey Allen once said of the third decade of life: "The only time you really live fully is from thirty to sixty. The young are slaves to dreams; the old servants of regrets. Only the middle-aged have all their five senses in the keeping of their wits." For Williams, perhaps he'll finally realize his achieved capacity to free his dreams, avoid the regrets of future punishment in the ring, and maintain the wits of his five senses to go fishing with his children. Perhaps he'll finally realize that it might be time to hang 'em up.